New Zealand mosque shooting: Syria's Khaled Mustafa and his 15-year-old son Hamza were the first who were buried on Wednesday. More bodies would be laid to rest later in the day. New Zealand Prime Minister Jacinda Ardern has announced that two-minute silence would be observed on Friday. She also said that the call for Friday prayers would be broadcast nationally. 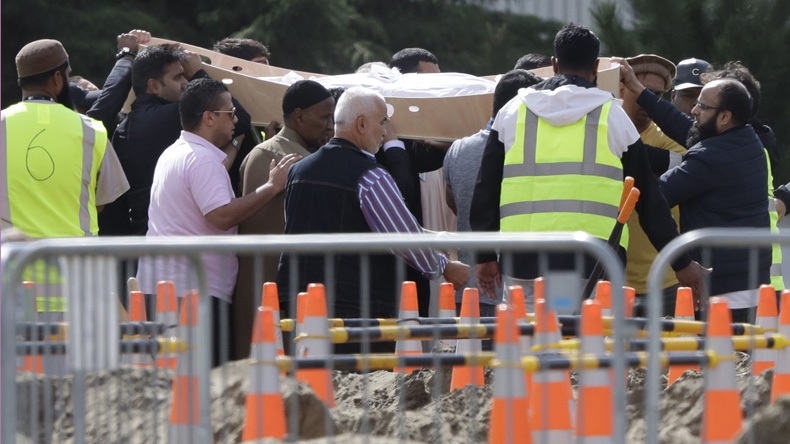 New Zealand mosque shooting: The burial of New Zealand mosque victims took place at Christchurch’s Memorial Park Cemetery on Wednesday with hundreds of people taking part in the last rites. The burial took place five days after the killing of 50 worshippers at Al Noor Mosque and Linwood Mosque. Among the 50 victims, Syria’s Khaled Mustafa and his 15-year old his son Hamza were laid to rest in a white shroud. Mustafa and his 15-year-old son, along with other family members had fled war-torn Syria to seek refuge in New Zealand. But little did they knew that Australian white terrorist would take their life. The bodies of Mustafa and Hamza were carried in open caskets, making the eyes of mourners wet. The delay in funeral has frustrated families of victims as Muslims bury their dead within 24 hours of demise. But the police maintained to follow a proper procedure. More burial would take place later in the day. New Zealand Prime Minister Jacinda Ardern, who met families of victims twice since Friday, said that the coming Friday’s call for prayers would be broadcast nationally. Jacinda regretting on the tragic incident said victims came to the country for safety but could not be protected. She announced that the country would observe a two-minute silence on Friday to remember victims. Jacinda earlier termed the mass shooting as a terrorist attack. Countries across the world have condemned the massacre strongly. Last week on Friday, Brenton Tarrant, 28, stormed Al Noor Mosque in Christchurch and fired indiscriminately at worshippers, killing dozens. Tarrant then drove his car and reached Linwood Mosque, where he repeated the terror act. Before perpetrating the terror act, Tarrant emailed his manifesto to the prime minister, parliament speaker, opposition leaders and media organisations. He had named Al Noor and Linwood mosques in the 87-page document. The gunman had broadcast live the attacks on Muslims. He used semi-automatic AR-15 rifles and shotguns in the terror act. New Zealand Police arrested Tarrant and produced him in the court. He was charged on account that murder. He is likely to face more charges. It is truly awe inspiring how New Zealand has responded to this tragedy. I have never been more proud to be a New Zealander. According to reports, 29 people were admitted at Christchurch hospital, among these eight people were stated to be in critical condition. "We in New Zealand will give him nothing — not even his name." Majority of the victims were either refugees or immigrants from India, Pakistan, Malaysia, Somalia, Turkey, Pakistan and Bangladesh. Meanwhile, the Friday sermons would be dedicated to the Christchurch mosque victims in Australia, as called by the Australian National Imams Council. The council said that killing of Muslim or any innocent person across the world, is an attack on all Muslims and all the people, adding that these acts of terror are aimed to divide people.